String buzz can be one of the simplest things to diagnose and solve for beginning guitar students. I say “can be” because the problem may be with the guitar and not the fingers. However, I would say that the majority of the times when a string buzzes it is due to poor finger placement. Check for these buzz creators. The solutions are implied in the description of the cause. A common reason a string will buzz is that the student is not pushing hard enough on the string. Have students use the very tip of the finger and push hard enough to get a clean tone, but don’t over push. Another cause is that the left-hand finger may be too far back in the fret (see picture.) It needs to be next to the upper fret wire (the fret closer to the body of the guitar). Another cause of a poor tone is putting the fretting finger on top of the fret wire, rather than just behind it. Putting a finger on top of the fret wire will cause a muted sound. 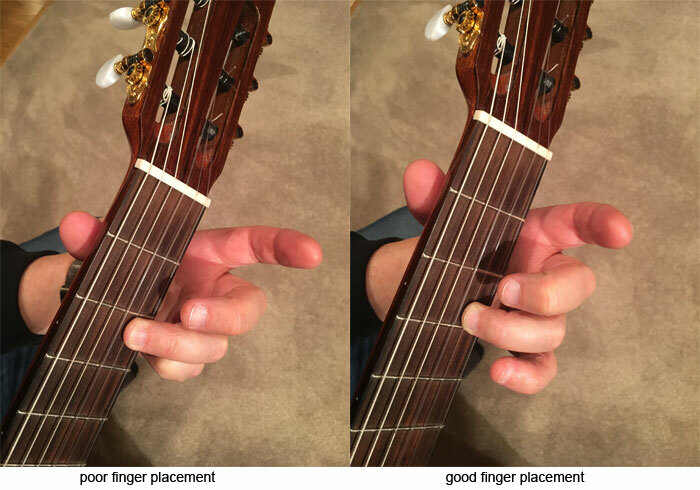 Another cause of a buzz is the fretting finger may be tilted and touching a string it’s not supposed to. This kind of buzzing happens sometimes when playing chords.